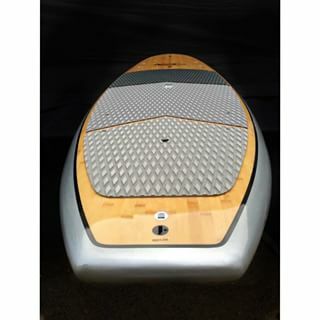 Dolsey is the first SUP maker to incorporate this feature in a SUP. The colored carbon fiber is under the finish thus eliminating paint chipping. The Polycarbonate skin is very durable, so much so, that bam bams and PCGs come with our 1 year consumer warranty. 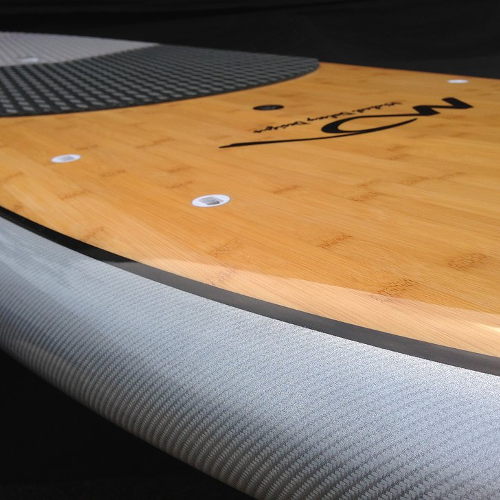 The PCG features colored carbon fiber rails, gloss finish, an accent pin line, a functional shape that glides well, a concave deck that makes our SUPs more stable, a 5-fin system, and a 3 tone high grade deck pad. New custmers love the look of the colored carbon fiber. The PCG is a solid performer in flat water paddling, paddle surfing, yoga, paddle fit classes, touring, and recreational use. The PCG comes standard with wood veneer top and bottom, a Q5 fin set up for ultimate control flexibility, one air vent, eight gear PFD tie down plugs, two cam mount plugs, one leash plug, and a 3-piece multi-tone traction pad.